The World War II evacuation of Japanese farmers from the Pacific Coast caused a staggering labor shortage created by the U.S. Government itself, which then wrestled with forced transfer of confiscated farmlands to new non-Japanese owners and lessees. 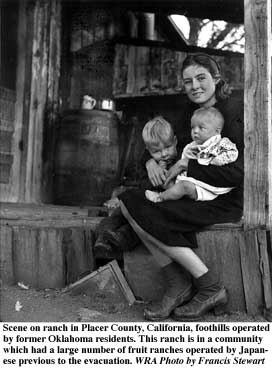 Most of the new owners were naturalized European immigrants, or Americans from the Dust Bowl region of the southern United States. Nobumitsu Takahashi, agricultural coordinator for the Japanese-American Citizens League, warned, as internment began in 1942, that removal of the Japanese would disrupt the California vegetable industry. Japanese truck farmers, he said, produced crops valued at 40 million dollars annually and interned Japanese stand to lose approximately 100 million dollars in investments because of confiscation or forced sale by the U.S. Government. The California Farm Bureau was quoted by The News, saying that Japanese farmers were responsible for 40 percent of all vegetables grown in the state, including nearly 100 percent of all tomatoes, celery, strawberries and peppers. Lawrence Hewes, regional director of the Farm Security Administration, charged with confiscating or selling Japanese land holdings, said FSA field agents had registered 6000 farms totaling approximately 200,000 acres. The FSA received applications to acquire vacated farms from more than 2000 farmers. Hewes said more than 1000 Japanese farms, totaling 50,000 acres, were transferred to new owners during March 1942. Of the 200,000 acres confiscated or sold under duress, the Wartime Civil Control Administration estimated, in April 1942, that nearly 43,000 acres were still available for new operators, and crops on 21 per cent of the total acreage subject to evacuation might be lost if substitute operators were not found soon. This would suggest that removal of the Japanese farmers was not in the best short-term interest of the United States and may have actually hurt the war effort. The San Francisco News published, March 4, 1942, a story that detailed percentages of crops grown by the Japanese, what they were and the economic impact internment would cause. 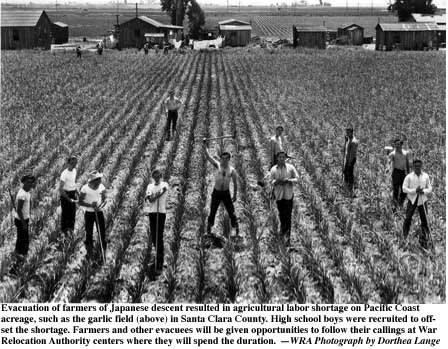 This second story, by John G. Brucato, was published five days later, but said nothing of the huge drain of farm labor created by forced removal of Japanese farmers. It is possible military authorities felt the first story would give important intelligence to Axis agents about Americas food production capacity, or the newspaper, as an act of self-censorship, simply dropped the issue of an artificial labor shortage from the Brucato story. The two photographs on this page, incidentally, are from the War Relocation Authority holdings of the National Archives, and were not published in the San Francisco News. The captions were written in 1942 by the WRA at the time the photos were released. John G. Brucato, founder of San Franciscos Farmers Market, was commissioned by The News to write of the labor shortage. Brucato was author of The Farmer Goes to Town; the Story of San Franciscos Farmers Market (1948), as well as A Sicilian in America: an Autobiography (1992). It was but a few short years ago that Californias farmers watched with open fear the highways with crawling, battered jalopies buried under bulging heaps of household utensils. The steady tide of the Dust Bowl refugees in their frantic search for a place to light and a chance to pick up their lives as agricultural workers was looked upon by the rural communities of Californias great central valley as a blight of locusts. The trail of the tattered army of migratory workers was dotted with ill-smelling, crowded, disease-laden ditch bank camps. The Okies and the Arkies swarmed in such numbers, snapping up jobs in the cotton fields and in the orchards, that they found it extremely difficult to earn enough to offset malnutrition. Health and rural school authorities became alarmed. Today, Californias farmers face an entirely different prospect. Gone is the surplus of agricultural labor. Vanished into thin air is the old fruit tramp and his ilk who used to follow the crops. Absorbed by the defense industries of the coastal cities are a large portion of the once-hated Okies. War has come to the farm lands as well as the cities. Greater production is expected from the wheat fields, the truck gardens and the orchards along with the factories. Yet at the same time the long arm of Uncle Sam has reached into rural areas and plucked thousands of young men from the farms and adjoining communities for military service. We estimate that we will face a shortage of approximately 100,000 farm laborers this season, said Ray R. Wise, director of the California Farm Bureau. In order to harvest our crops it will be necessary to exploit every possible source of labor in the state, Mr. Wise said. State and Federal agencies, farm groups, and representatives of the State Chamber of Commerce and the agricultural committee of the San Francisco Chamber of Commerce have given the problem of rounding up labor for Californias rich harvests close study. Officials of the Farm Bureau have considered the possibility of bringing in people from sections adjoining the Dust Bowl area, but admit the problem of transportation offers almost insurmountable difficulties. We would prefer to have our people pitch in and help us solve this tremendous problem, Mr. Wise said. Schools in the rural areas could have their vacations adjusted to correspond closer to the harvest seasons. That will give us a potential labor supply of approximately 40,000 young people, he said. The problem is far too big, however to be solved just by rural communities. It will require the aid and co-operation of city folks as well. Farm groups today are asking the people in the cities to give earnest consideration to plans for the entire family combining their annual outings with a bit of work in the field or orchards. Proponents of the Victory Vacation idea point out such vacations not only would be patriotic but would also be a matter of good health, through exercise and fresh air, and would pay those making the gesture definite cash returns.